Bausch & Lomb Sensitive Eyes Multi-Purpose Solution cleans, rinses and disinfects soft contact lenses. Contact lens solution for your sensitive eyes. 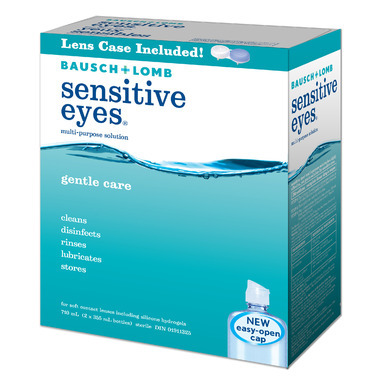 Bausch & Lomb Sensitive Eyes Multi-Purpose Solution is specially formulated to work with your natural tears. Keep your sensitive eyes comfortable with a solution as gentle as your natural tears. Bausch & Lomb Sensitive Eyes Multi-Purpose Solution is proven to fight germs and clean your soft contact lenses. Following the prescribed daily rub regimen may eliminate the need for a separate enzymatic cleaner. Be sure to consult your eye care professional if you have questions about your specific recommended regimen. Contains Dymed and poloxamine for clean, comfortable lenses.